Worldwide, Apple is so much more successful than any other MP3 player manufacturer, it’s unreal. The iPod enjoys an unprecedented market share in almost every country in the world. But not Germany. In Germany, a small company called TrekStor from South Hessia in south-west Germany, sells more MP3 players than Apple does. And now the company is bracing itself to take the UK by storm. Not only does it believe it can be a booming success in the UK, it’s aiming to become the Number Three manufacturer (behind Apple and Creative) before the end of 2008. TechRadar stopped by the TrekStor stand at CeBIT to have a chat with Gil Szmigiel, TrekStor’s chief technology officer. “In Germany we’ve been going since 2001. In most markets we’re in, in Germany, we’re in the top three brands, and in a lot of cases we’re number one. For example in the MP3 player market, Apple is the biggest brand in every country in the world. But not so here in Germany. We sell more MP3 players than Apple does here,” he said. Szmigiel said that the German press regularly rates TrekStor MP3 players higher than those made by Apple, Creative and SanDisk. And he made no bones about the fact that he firmly believes that TrekStor players are better than the rest. “We have over 120 awards for our MP3 players already and that’s because we’re not trying to force the customer into acting in a specific way – like only buying music from iTunes where you can’t put other music on your device. You can use DRM 9 and DRM 10 with our products as well as normal MP3 and WMA files. TrekStor’s enormous success in Germany has been used as a springboard to launch in other European countries such as Spain, Italy and Turkey. “So now we’re trying to bring our success in Germany to the UK,” Szmigiel said. “And the UK is the biggest market for MP3 players in Europe. We’re actually got an engineering team in Cambridge. We’ve got a wide range of products too from very low end ones to very high end ones. 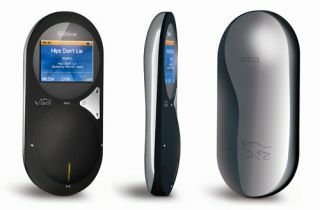 The TrekStor Vibez player for example is a high-end product. We couldn’t help but be a bit sceptical about TrekStor’s prospects in the UK. But Szmigiel indicated that it might not be as hard as some might think to overtake some of the other players in the market. “Can we overtake Creative and SanDisk in the UK? Sure yes, it’s perfectly possible to overtake them but with Apple it’s a little more complicated. The iPod is so well established in the market, and there are so many people who just love Apple and everything they’re doing. Apple are a company not only producing products but also an ever-growing fanbase. It’s very difficult to top that. “It’s not really our goal to beat Apple in the UK. It might be our goal in two years time or something like that, but not yet. However, despite the ever-growing fanbase that Apple has. The hate-base is also growing. There are many people who hate Apple products or things that they do. Like with the iPhone they blocked out third-party software; that didn’t go down well. “We thought about being number 5 in the UK before the end of 2008. But internally we’re trying to be the UK’s Number Three MP3 player manufacturer before the end of the year behind Apple and Creative,” he said. TrekStor is sending TechRadar a collection of its MP3 players so next week we’ll be able to give you the low-down on whether the likes of SanDisk and Creative should be worried.